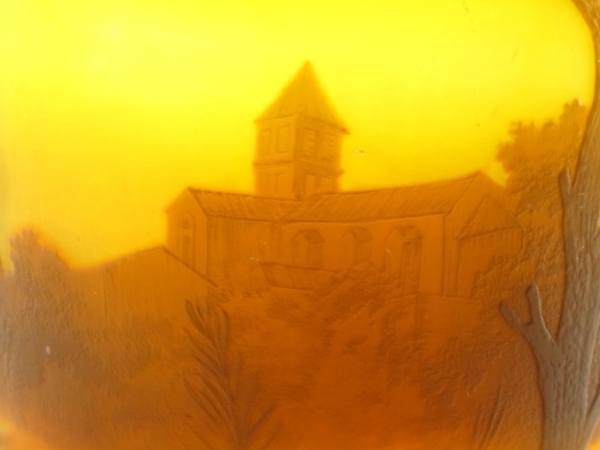 D’Argental – A beautiful Art Deco acid etched cameo vase showing the church of Notre Dame et Saint-Junien in the town of Lusignan in France. The landscape shows the River Vonne in the foreground. 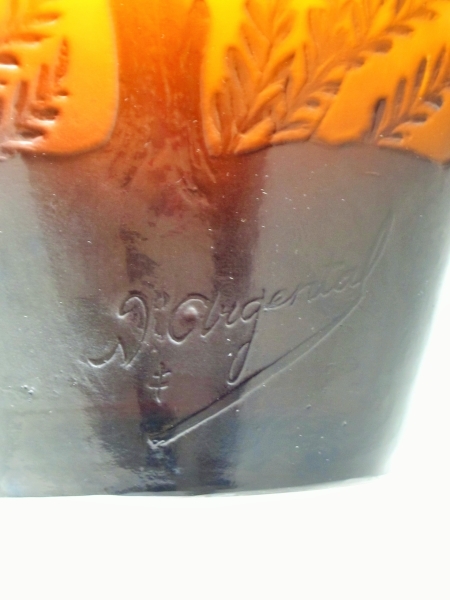 The vase is signed D’Argental and titled Lusignan. 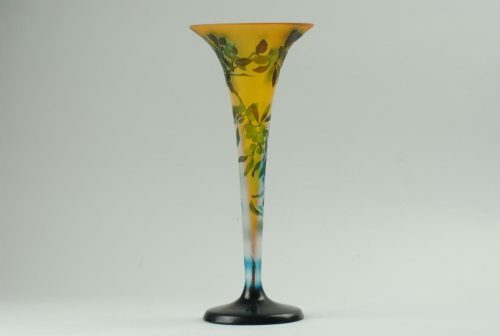 It is understood that this vase was a special commission and was designed and made by Paul Nicholas when he worked at D’Argental (St Louis Glassworks). 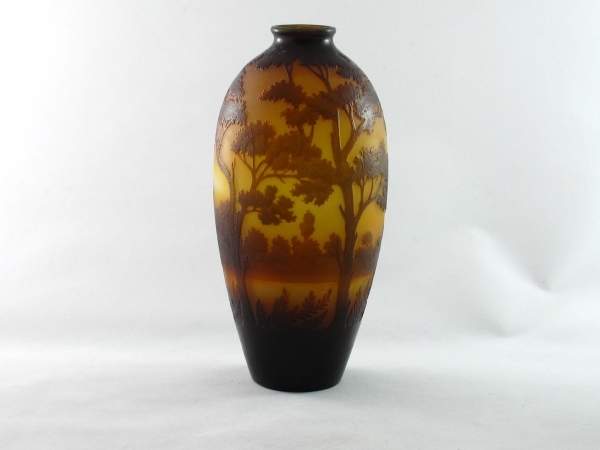 In excellent original condition this is a superb quality piece. Saint Louis, Compagnie des Cristalleries de St Louis. A significant French glasshouse producing glass of the highest quality, founded in St Louis, near Bitche in the Munzthal, Lorraine in 1767 but based on a much earlier glassworks. Produced sulphides and were famed for paperweights, both for their quality and characteristic murrhine. 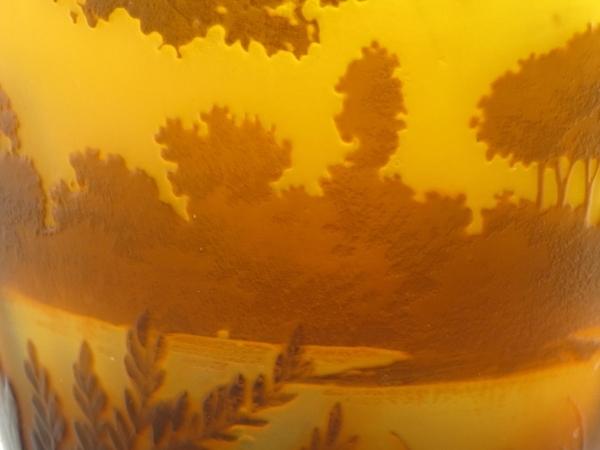 Cameo acid etched designs, sometimes fire polished were produced. Renowned for their fine detail and high quality. 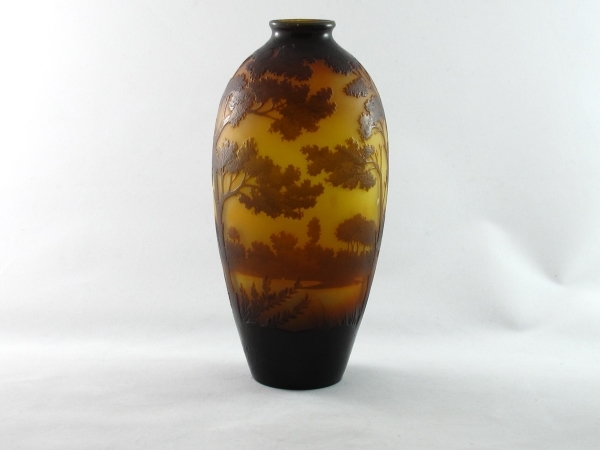 In addition scenic lamp bases and vases along with animal themes such as deer, elephants and tigers . St Louis pieces are sometimes signed St Louis Munzthal or D’Argental. 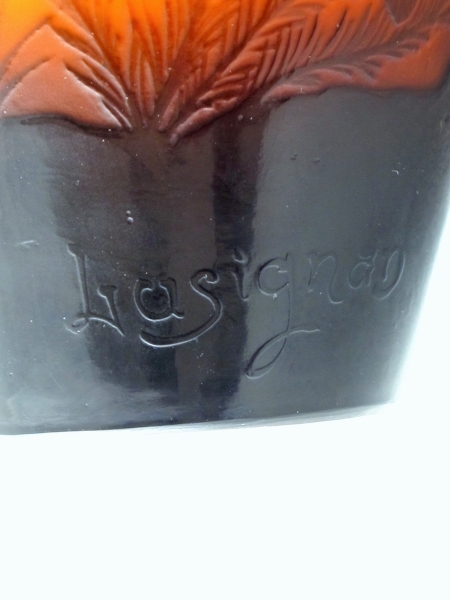 The company also produced metal and bronze mounted vases. 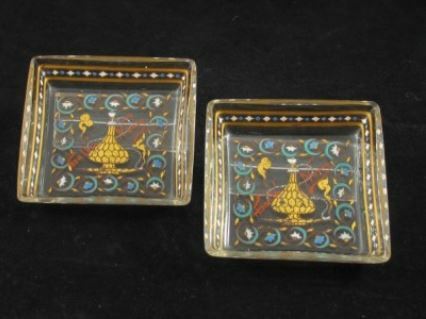 Art Deco style glass with enamelling and engraving was introduced in the 1920’s. Designs by Dufrene and Goupy were executed. Also for Galleries Lafayette. 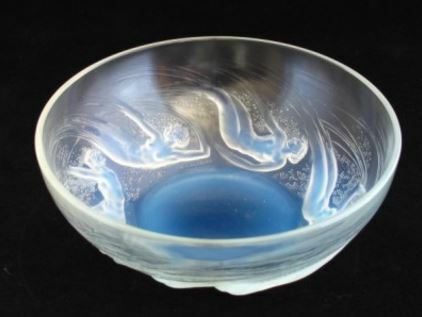 Despite the fact that Rosenthal had no experience of glass production they took control of St Louis between 1942 and 1944. 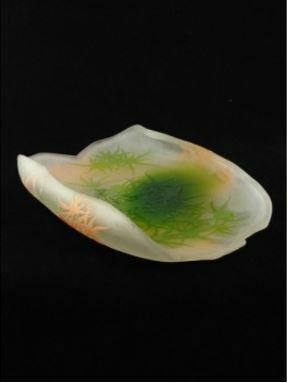 Jean Sala was director of St Louis during World War Two but continued designing on a freelance basis until the 1950’s. The works has had a tendency to introduce new influences with subtlety and variation on classic designs with no sacrifice in quality. Magnificent stemware for most of the history of the company. All pieces noted for their precision and quality. Paul Nicholas (1875-1952) born in Lorraine and began working for Galle from 1893-1918. His first individual works were produced from 1908. He left Galle to work for St Louis in 1918.